If you're lucky enough to know what it's like not to be surrounded by darkness, I'm telling you, someone near you needs kindness. 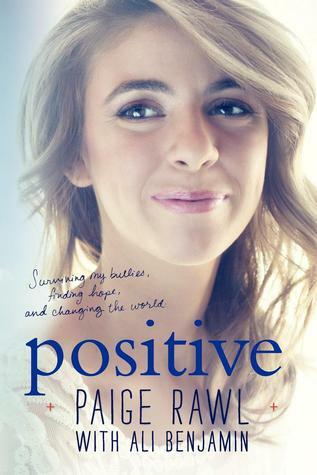 Paige Rawl was born with HIV. It has always been a part of her "Normal." But one day in middle school, an offhand comment to a friend whom she was trying to comfort resulted in the entire school knowing she has HIV, something her mom wished for her daughter to keep private. The sharing of that secret was the beginning of the end of Paige, not only because it resulted in bullying from her classmates, but also because the adults in her life, who were supposed to know better, seemed to be just a vicious. This book is Paige's journey of trying to stay healthy while enduring endless torment at school. Positive is a page-turning book that I couldn't put down. Paige Rawl's experience with bullying in middle school because of her HIV positive status is heart-wrenching. I couldn't help agonize of how the adults in her life wronged her so so profoundly. This would be a wonderful book to share with students about how our words and actions can leave long-lasting scars.